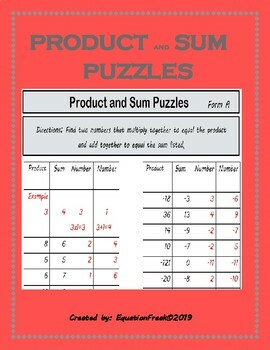 Every year before I started our factoring unit I would give these product-sum puzzles to my students. They had so much fun working on them and never knew that it was getting them ready to begin factoring. You can run the sheets back to back and two of the puzzles will take about 45 minutes for the students to complete. There are four different puzzles included A, B, C and D with D being a bit more challenging. Your students will enjoy this activity!